A surround-screen swimming pool can realize various forms of underwater entertainment and enable enhanced swimming training with supplemental visual information during underwater activities. However, one of the big challenges for such an augmented swimming pool is user interaction because the surround screen and water can make existing position-tracking methods unusable. 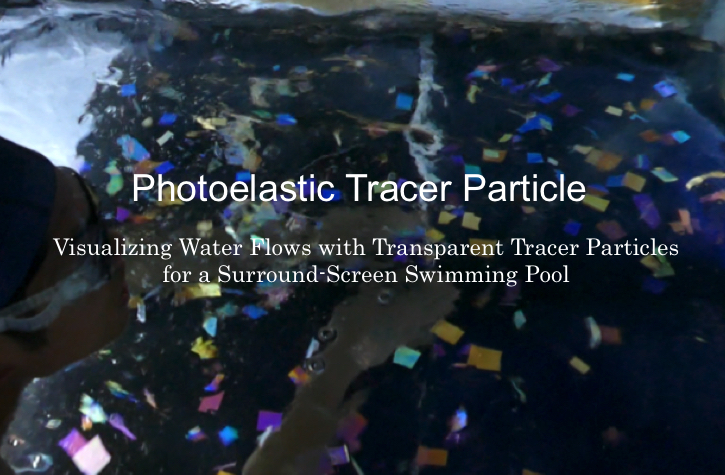 In this paper, we propose a water flow visualization method with transparent tracer particles to enhance interactivity. We used an optical property of clear plastics called birefringence that provides vivid colors on transparent tracer particles when they are between two circular polarization sheets. Tracing objects using cameras in front of a complex background is not a stable method, but this technology enables visible tracer particles on a simple and dark background. For underwater entertainment, the water flow tracing works as a user interface because the transparent tracer particles do not stop users from viewing the images on the screen. For enhanced swimming training, swimmers can view visualized water flow caused by strokes in the augmented swimming pool. From the results of our stability evaluation of water flow tracing, the proposed method is valid even for complex backgrounds. We also conducted a feasibility test of the enhanced swimming training. According to the trial, the tracing particles could visualize the water flow caused by the strokes made by a swimmer.